DocuBank® Emergency Card - Thompson Law, P.C. Many attorneys will provide their clients with health care power of attorney documents, but what they don’t tell you is that these documents are usually not available when they are needed. According to a study in The Journal of the American Medical Association, in three out of four cases, a patient’s health care documents are unavailable when needed by a hospital. This is one of the main reasons that Thompson Law, P.C. participates in the DocuBank® Emergency Card program. The DocuBank® Emergency Card ensures your health care documents are available when they are needed, anytime of day, anywhere in the world. 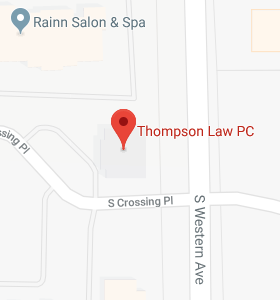 Our team at Thompson Law, P.C. is committed to making your customized documents work. Therefore, we offer DocuBank® as an optional service to make your health care documents available whenever and wherever they are needed. If you choose to participate, we will enroll you in DocuBank® at the signing meeting. The membership is provided complimentary for the first year for Thompson Law, P.C. clients who have a Living Trust. At the end of the complimentary membership period, clients will have the option to renew the membership directly through DocuBank® for a significantly discounted price.